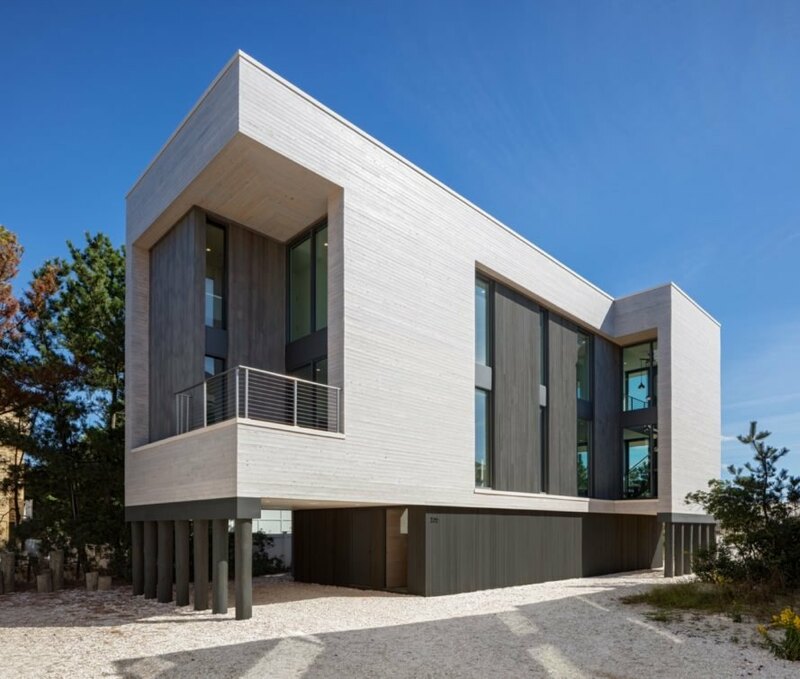 In the wake of Hurricane Sandy, American firm Specht Architects designed the Beach Haven House, a contemporary home built to withstand hurricanes and harsh weather. Crafted with boat-building techniques and materials, the resilient beachfront house in New Jersey’s Long Beach Island serves as a weekend getaway for a family of five. The elevated 2,500-square-foot home is wrapped in two types of cedar siding and features a fiberglass roof, stainless steel exterior components and large panes of hurricane-grade glass that frame views of the surroundings. When Hurricane Sandy ravaged the Northeast U.S., Specht Architects had already started on a renovation project in New Jersey’s Beach Haven community. In the wake of the superstorm however, new beachfront regulations enacted by FEMA forced the architects to begin the design anew in order to meet revised requirements. 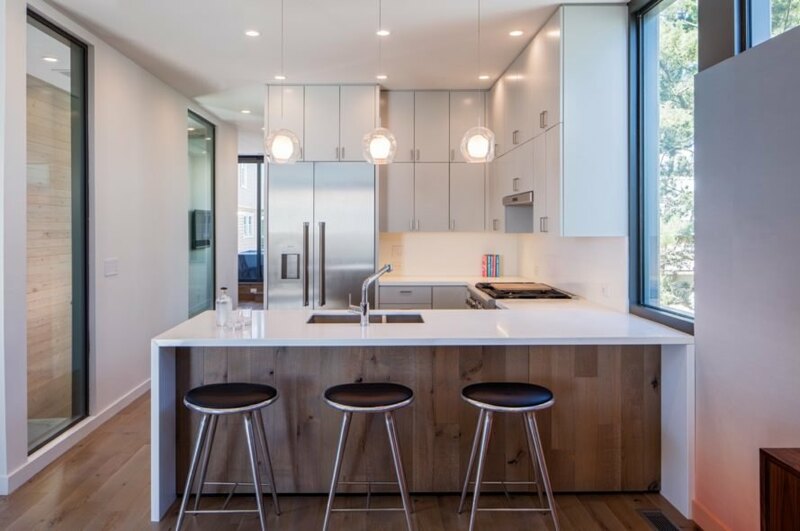 “The challenge was to create something open and light-filled that takes advantage of its beautiful setting, yet uses every available square inch of buildable area allowed by law,” explained Specht Architects, citing the many code-regulated square-footage and height restrictions. The home is elevated on stilts to comply with FEMA’s Base Flood Elevation and sits atop a carport lined with gravel. To allow the home to embrace the outdoors, the architects added large windows, balconies and tear-away panels. A stairway on the south side of the home leads up to the second floor that primarily houses the communal areas. An open-plan kitchen, dining room and living area — which also open up to a shaded balcony — occupy much of this floor. The second floor also consists of a flex room that can be used as an en suite guest room or office space, a TV lounge area and a hot tub. 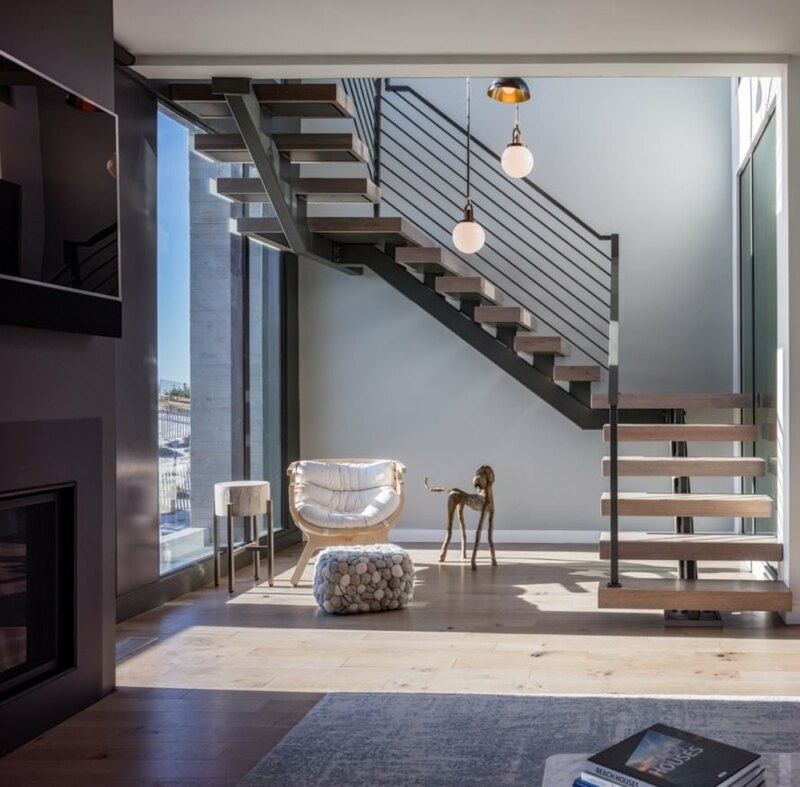 On the side of the living area is a sculptural open tread timber staircase that leads up to the third floor and overlooks views of the ocean through floor-to-ceiling windows. On the east side of the upper floor is the en suite master bedroom that connects to a balcony and faces sunrise ocean views. The floor also houses three children’s bedrooms — each uniquely styled like a “ship’s cabin” — and a shared bathroom on the far west side. Windows are of the highest hurricane-rating available. Two types of cedar siding clad the building. The second floor houses the living area, kitchen and dining room. The dining room features modern furnishings. Bar seating pulls up to the counter in the kitchen. A set of open tread timber stairs and a black metal railing lead up to the third floor. 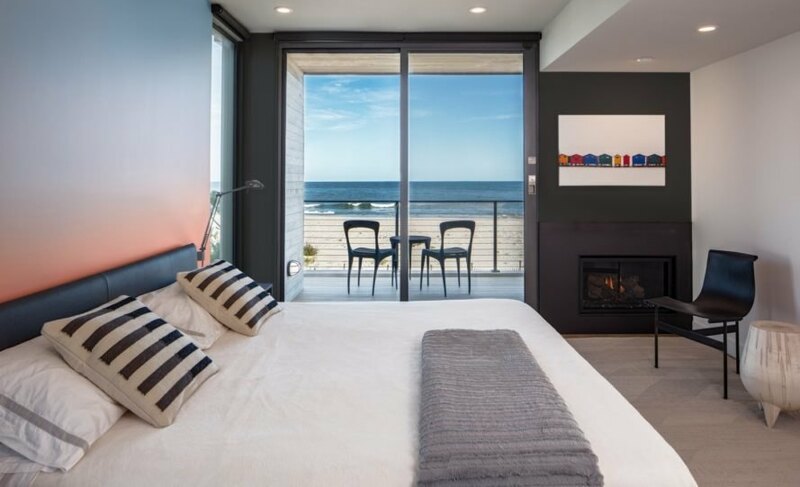 The master bedroom connects to a balcony facing the ocean. 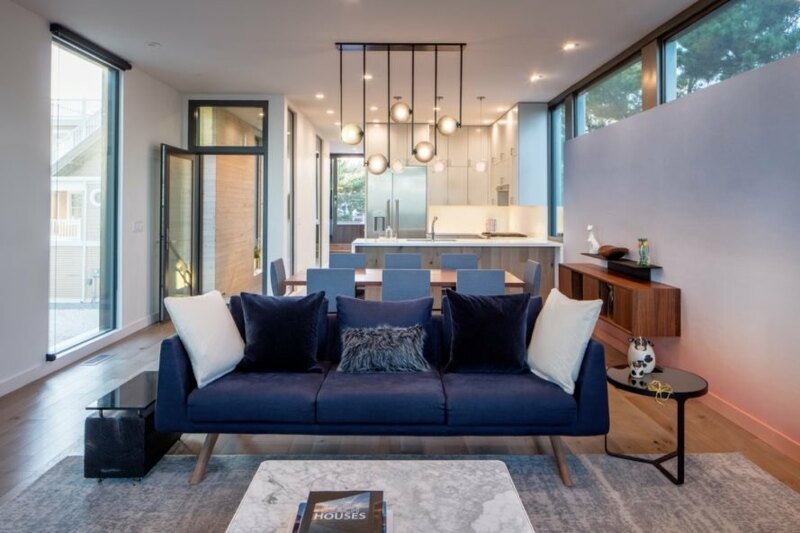 The open floor plan creates an airy, inviting space for the family. A look at the upper floor plans.